I've forgotten to upload a bunch of pieces here so I picked my favourites. Shrug. Sorry for the spam. i've been doing commissions over on tumblr which i haven't posted here yet but will soon. kinda sorta back, probably won't see a lot of original content from me though, unless the need for me to do commissions dies down. health wise: it's not terrible relatively speaking (it's been worse) but i still really shouldn't be drawing. oh well! for school and health reasons. still check into deviantart every few days or so but art from me is gonna be scarce for a while. I didn't realise I hadn't updated since February, my goodness. Well, basically, here's the lowdown: I've been having a lot of issues with chronic pain and my commissions are closed indefinitely (barring any emergencies). Since I can no longer keep up with the demands required to make a living off of freelancing, come August 31st I'll be starting school to work towards a bachelor's degree in computer science. I'll still be here and posting art every so often but I am just not certain how much time I'll have for art once school starts. So after a bit of work, I finally have a new URL! 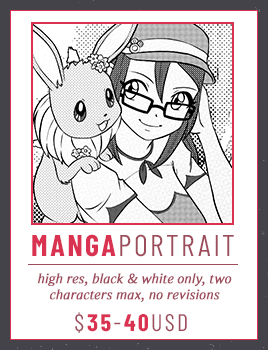 To celebrate, I created a new look for my site, updated my commission info, and updated my portfolio. If you're interested in commission work from me, have a look at my new info (link below). I'd like to give a shoutout to Graham from ice-media.co.uk for his help setting it up. • Please consider checking out my patreon and making a subscription! Patreon is my primary means of income and it would be wonderful to be able to take requests and stuff without sacrificing paying bills. • If you haven't already, check out my comic lime, which I am illustrating while a friend writes the script. • Commissions are open. If you're interested, please send me a message! If you've commissioned me before and would like to upgrade or have me redraw your commission entirely, there's a discount in it for you! Hi everyone, just a few updates! • New Project! I'm currently in the preparation stages for a new comic project. I'm not sure how long it will take to get started, but it's got dragons and magic, and irreverent scoundrels. Stay tuned! Eh it's a couple days early but some October updates! • I've slowly started prep work for another original comic, this time of the fantasy variety. Those who have been following me for a while may remember my old NaNoWriMo project, Zathryn. This comic will be based off that. Keep an eye out for it! • Commissions are OPEN. 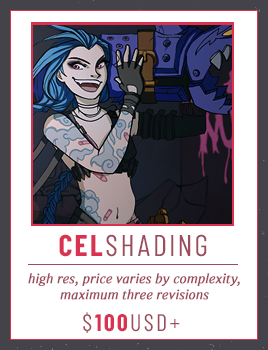 You can find my commission info [here]. There is about a 1 - 2 week queue, so please let me know ahead of time if you need your commission by a certain date. Hi everyone! As many of you know, I recently started a patreon account so I can work full-time on my comics and my Filipino racebending series. How it works: You subscribe to me for a monthly amount. It can be as little as $1 USD, or it can be as much or more than $100 USD. It’s up to you and what you can afford. In return, I give you stuff! Neat, huh? What your money does: It makes sure that I can keep doing all the stuff you guys enjoy! If I can get funded on patreon, there is no need for me to take on extra work in order to pay bills, which means I can go full-time with all my projects. What you get: All patrons get early access to my work, exclusive sneak peeks, and exclusive livestreams. Depending on how much you pledge, you can also get free sketches, free prints, free fully rendered pieces, customised tutorials, one-on-one livestreams, you / your character featured in a comic… you get the drift! And for every pledge total milestone I reach, there are even more goodies and benefits! Things I’ll make with funding: The two biggest, in-progress projects at the moment are lime, a comic I am working on with zombizombi, and my Filipino racebending series. You can view progress on lime [here], and view the racebend series [here]. I also have plans for a comic called Zathryn, based on an old NaNoWriMo piece, and a yet-unnamed comic ouyangdan and I are collaborating on. Great! What now? Please feel free to go ahead and [subscribe to my patreon] and reblog this post to share with your followers. If you have any questions about this, send me a note or reply to this journal! Update May 28th, 2014: just waiting on my case and monitor, both of which should be here on friday. I'll likely be holding a small livestream in celebration, but we'll see. 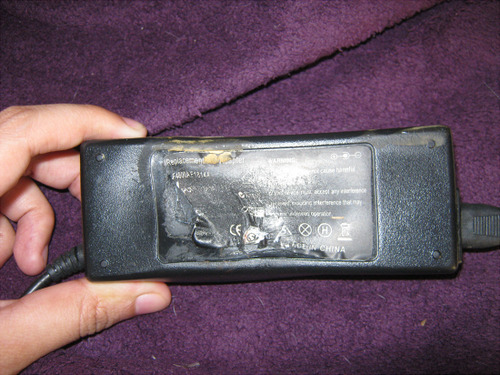 Oops, my laptop charger melted! Hi everyone (: Sorry for the radio silence lately, some stuff has been going on and while that stuff is on the mend I ran into a huge problem. 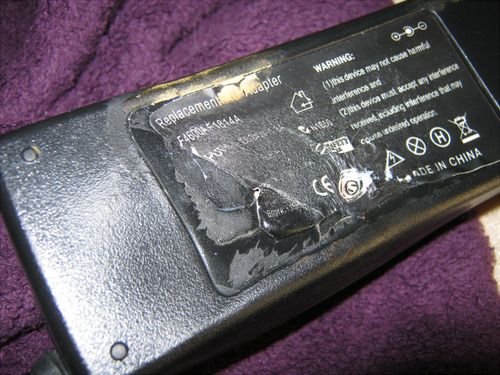 As you can see in the pictures below, my laptop charger started melting (this happened the night before last). I'm currently building a desktop and I'm about $300 USD short on completing it. I wasn't in a big hurry originally, but since I'm on a borrowed charger and it's apparent my laptop can no longer handle RAM-sucking programs like photoshop, I'm accepting emergency donations at the following link: Donate~~~! Hi guys! Just wanted to let you all know that commissions are open and that my commission info & prices have been updated. Wide open. Wide, wide, WIDE open. 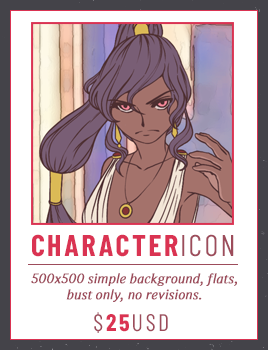 ;x My commission info can be found below, and you can contact me on my site. (Sorry, no notes! It's too hard for me to keep track of my commissions over multiple platforms). In other news, my Filipin@ racebend project is going really well! The tumblr post of my Filipin@ Rapunzel is almost at 7,000 notes at the time of this writing, and the tumblr post of Filipin@ Ariel is also picking up steam. I've made plans to do a nine piece series on this, with Filipin@ Merida up next. All pieces will be available as 4x6 mounted foam board prints via my site or directly through Etsy, with free shipping anywhere in the US. Just in case anyone missed it, commissions are OPEN! There is only one piece in my queue at the moment, and it's nearly done (I'll be finishing it up today, actually), so the doors are wide open. Even if you can't commission me, please feel free to spread this around on my behalf. I also have posts on a few other social media sites that you can share if you'd like! I have to say, I just really hate technology sometimes. Gonna have to take an unscheduled break because my external HD's usb cord shorted out. It's been touchy the past few weeks, I've had to finagle it just so in order to get it to connect properly, but the past week has just been impossible to get it to connect. Honestly, I was spending more time trying to get it to get recognised than I was working. 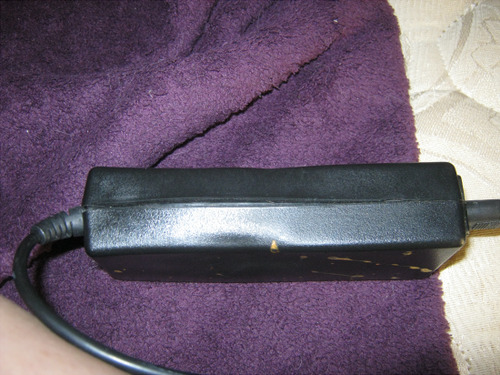 So I ordered a new cord off amazon with expedited shipping. I guess it's technically following the "expedited" shipping but considering it spent the majority of the week being "processed" it doesn't feel very expedited. Anyway, I'll be back to work when it arrives, which should be sometime Monday. Sorry! If you're interested in a commission, contact me on my site. I also have made progress on a future print, if you're interested in looking! New year, new layout! Pop on over to my website to look at new commission prices, the new design, and new examples of my artwork. Upcoming: Prints for sale! Both for premade pieces and custom work. Details soon! Regarding prices: All prices have been increased slightly to accommodate for my increased bills. That said! Unfortunately, I can no longer afford to do large-scale projects (site designs, concept art / turnarounds, large full shaded pieces) at my old prices; from now on all pieces of this magnitude will go for a base rate + hourly rate under contract to make sure I do actually get paid for the work involved in the piece. Large projects will be reviewed on a case-by-case basis, starting at a base price of $50.00 USD plus an additional hourly fee ranging from $20.00 - $50.00 USD. I was, unfortunately, taken advantage of a few times last year when doing large commissions; a handful of these projects wound up earning me around or less than $4.00 USD an hour. These issues were further compounded when clients would disappear for weeks at a time. To ensure that I can do frivolous things like eat and pay my bills, all large projects are now subject to this policy. But don’t worry! All contract agreements will have a price cap to protect us both — a “no more than” price to ensure that a) you don’t overspend, and b) I don’t get people tacking on more work than was originally paid for (which happened several times last year). I know this isn’t the kind of post I usually make about my commissions / work, but I believe in transparency and making sure my client base — you guys! — understand why there’s a price increase and know that I’m doing my best to make sure that we both get what we’re looking for. If you have any questions about the new prices / policies, or would like to order a commission, please contact me via my website. 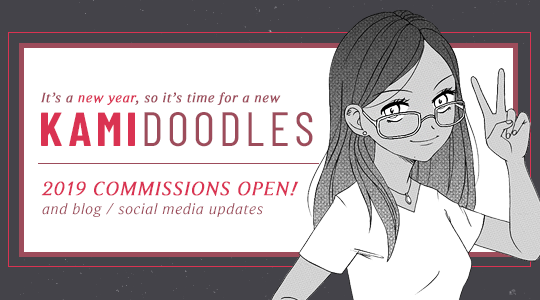 Dec 30, 2018 January 2019 Commissions Open! Dec 11, 2014 December Updates! Nov 15, 2014 November Updates! Jun 16, 2014 kamidoodles on patreon! Jun 2, 2014 i'm back, baby! 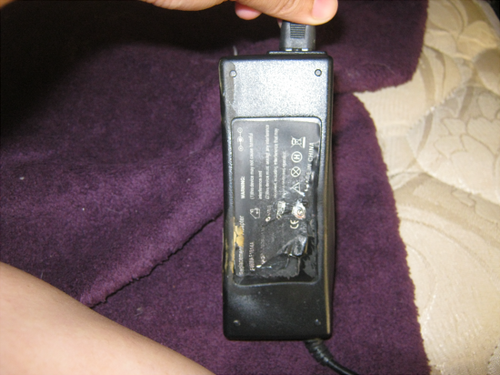 Apr 28, 2014 Oops, my laptop charger melted! Mar 4, 2014 Commissions Open! 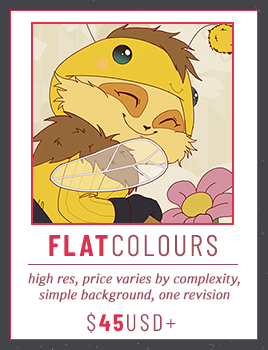 Feb 12, 2014 Update / Commissions Open! Jan 17, 2014 Commissions Open! Jan 11, 2014 Ugh, technology. Jan 2, 2014 Happy New Year!